Virtual Sports, which has been branded as a mixture of eSports, slot machine games and sports betting, has long been a popular filler product in European betting shops. 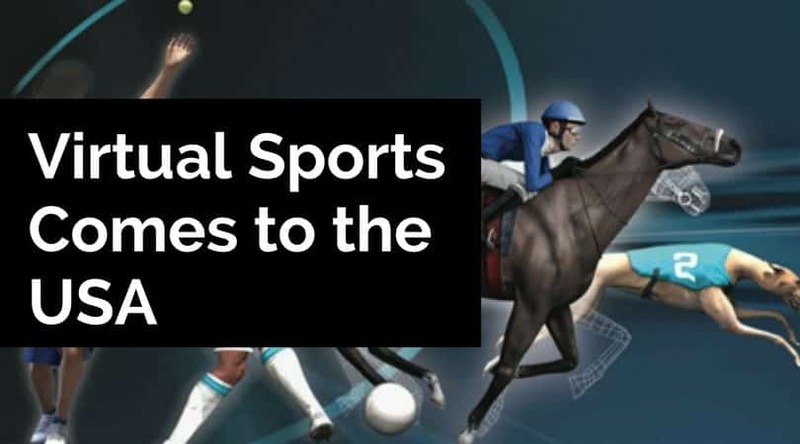 While it is only run when there is downtime at these venues, Virtual Sports has been reported to generate 20 per cent of the revenues in UK betting shops. The product brings the excitement of sports betting to customers without violating any sports betting laws. As a result of all these factors combined, Virtual Sports has caught the attention of players and operators in the USA alike. While a handful of casinos in Las Vegas and Atlantic City have already started offering Virtual Sports to their customers, a bigger wave is expected to be coming across to the other side of the Atlantic soon. Last year, in July 2016, William Hill US added virtual horse racing at two of its land- based sportsbooks in Las Vegas. Since then, that number has increased quite a bit. William Hill US now offers virtual horse racing at nine of their Las Vegas venues. The British bookmaker expanded their business into the USA in the summer of 2012. William Hill started their American offerings by buying three chains of sportsbooks that operated exclusively in Nevada, as it is the only American state to offer full- fledged sports betting. The deal gave them a solid start in the market. The chains were subsequently rebranded under the William Hill name, giving their brand widespread visibility. After the successful trial at the William Hill US sportsbooks, Inspired Gaming LLC. decided to venture into the sector as well. The company received regulatory approval from the Nevada Gambling Control Board towards the end of last year. A full rollout of virtual sports in Nevada is likely to occur sometime this year, in 2017. The Virtual Sports offerings at the Nevada casinos are expected to be interspersed between real life sporting events. Inspired Gaming has also started working with two big casinos in the Atlantic City area already. However, due to the differences in sports betting laws in the state, Virtual Sports have to offered on their own to New Jersey bettors. Virtual Sports can be offered in New Jersey through both the casinos’ online partners and at bars and special areas at their brick and mortar facilities. Resorts Casino Hotel, the first legal casino that was authorised outside of Nevada, is one of Inspired Gaming’s partners. They plan on incorporating Virtual Sports with their existing line of online casino products. Resorts will also offer the service to their patrons through designated on- property locations. The other property that has decided to partner up with Inspired Gaming LLC., to offer Virtual Sports, is the Golden Nugget Atlantic City. The casino hotel, which opened in 1985 as Trump's Castle, will exclusively offer Virtual Sports through their online casino. Earlier this year, yet another company, Leap Gaming PLC., also decided to partner up with Pala Interactive LLC. to add Virtual Sports to the social casino’s portfolio. At the moment, they only offer free to play Virtual Sports contests on their social casino platform. It has been confirmed that they plan on rolling out a real money version at their New Jersey property very soon. Pala Interactive LLC. is an online social and real money gaming software development company. It was founded in 2013 and their majority shareholder is the Pala Band of Mission Indians. The Pala Band of Mission Indians is a federally recognised Native American tribe from San Diego area in California. They own and operate the Pala Casino Spa and Resort, which is located on the Pala Indian Reservation. It is surprising that such a popular yet malleable product is not more widespread in the USA casinos. This may in part be due to the complicated gambling laws that they have to follow. This could explain why it caught on so quickly in Europe but is taking its time making its way to the other side. However, Lissauer also mentioned that he has noticed a new trend emerging. The casino side of Virtual Sports has been particularly of interest in America. There they have the opportunity to customise their offering and produce and provide exclusive, premium content. Leap Gaming has decided to capitalise on its full turn- key solution (server side and client side) for Virtual Sports. They have also added some exclusive features. One such feature the company has produced is the Instant version of Virtual Sports, which allows individual users to generate events in accordance to their needs and demand. Many experts have also said that logistics played an important part in the growth of the Virtual Sports sector. This would explain why it has been slow to make its way to the US market. Lissauer explained that horse racing and betting shops are a common part of everyday life in the UK. As Virtual Sports, in its early days, heavily depended on these sporting activities, it makes sense that UK would be the place of origin for the concept. He also added that as this is not commonplace in the USA, the concept took some time to gain the required attention from both players and operators. Ed Andrewes, the CEO of EA Gaming Consultancy, which manages Resorts’ digital business, also chimed in on the subject. He said that Virtual Sports gained traction in the European market as a filler for other events. As such events are not carried out in most parts of the USA, Virtual Sports content providers found it harder to gain a footing on that side of the Atlantic. He also added that the same reason explains why Virtual Sports quickly managed to gain a presence in certain states of the country before others. Jim Ryan, the CEO of Pala Interactive LLC., also noted that the same market constraints exist in the online casino sector in the USA. He said that given the restrictions that are outlined in the country’s gambling laws, the market for online Virtual Gaming in the USA is much smaller than that of Europe. This is why most suppliers have been focused on European venues until now. Ryan’s company, Pala Interactive, was one of the first US- based online operators to offer Virtual Sports through the Pala social casino. He also mentioned that despite the late arrival, there seems to be a great prospect and huge momentum for its growth. The USA is dotted with many luxury casinos, and online betting has also become a growing enterprise. Virtual Spots in a novel concept for the market, but most experts agree that there is great potential for the product given the structure of the gambling community in the country. Calapp also added that Virtual Sports could enhance potential fan experience at casinos. This in turn could really boost visitation from sports fans. He said Virtual gaming is capable of recreating the fan experience from travelling to a game, gathering at a venue, and even the highs and lows of a sporting match as it unfolds. Calapp believes that with Virtual Sports, “Players can really feel the fast paced action of live sporting events but in the digital world.” Virtual sport has had a promising start in the USA and it looks like all industry experts are confident that it will only go from strength to strength from here on.